From Westfalia, Germany. Produced by Mikora Modellbau Manufaktur. Juweela also produces figures. Ceramic and resin diorama accessories. Ex-Kaliber 72. 27019 Bricks - red light Ceramic bricks. 250 pieces. 27020 Bricks - red light Ceramic bricks. 500 pieces. 27021 Bricks - red light Ceramic bricks. 1000 pieces. 27022 Bricks - red light Ceramic bricks. 2000 pieces. 27023 Bricks - red light Ceramic bricks. 5000 pieces. 27024 Bricks - red light Ceramic bricks. 10000 pieces. 27025 Bricks - red medium Ceramic bricks. 250 pieces. 27026 Bricks - red medium Ceramic bricks. 500 pieces. 27027 Bricks - red medium Ceramic bricks. 1000 pieces. 27028 Bricks - red medium Ceramic bricks. 2000 pieces. 27029 Bricks - red medium Ceramic bricks. 5000 pieces. 27030 Bricks - red medium Ceramic bricks. 10000 pieces. 27031 Bricks - red dark Ceramic bricks. 250 pieces. 27032 Bricks - red dark Ceramic bricks. 500 pieces. 27033 Bricks - red dark Ceramic bricks. 1000 pieces. 27034 Bricks - red dark Ceramic bricks. 2000 pieces. 27035 Bricks - red dark Ceramic bricks. 5000 pieces. 27036 Bricks - red dark Ceramic bricks. 10000 pieces. 27037 Bricks - red mix Ceramic bricks. 250 pieces. 27038 Bricks - red mix Ceramic bricks. 500 pieces. 27039 Bricks - red mix Ceramic bricks. 1000 pieces. 27041 Bricks - red mix Ceramic bricks. 5000 pieces. 27042 Bricks - red mix Ceramic bricks. 10000 pieces. 27043 Bricks - beige light Ceramic bricks. 250 pieces. 27044 Bricks - beige light Ceramic bricks. 500 pieces. 27045 Bricks - beige light Ceramic bricks. 1000 pieces. 27046 Bricks - beige light Ceramic bricks. 2000 pieces. 27047 Bricks - beige light Ceramic bricks. 5000 pieces. 27048 Bricks - beige light Ceramic bricks. 10000 pieces. 27049 Bricks - beige medium Ceramic bricks. 250 pieces. 27050 Bricks - beige medium Ceramic bricks. 500 pieces. 27051 Bricks - beige medium Ceramic bricks. 1000 pieces. 27052 Bricks - beige medium Ceramic bricks. 2000 pieces. 27053 Bricks - beige medium Ceramic bricks. 5000 pieces. 27054 Bricks - beige medium Ceramic bricks. 10000 pieces. 27055 Bricks - beige dark Ceramic bricks. 250 pieces. 27056 Bricks - beige dark Ceramic bricks. 500 pieces. 27057 Bricks - beige dark Ceramic bricks. 1000 pieces. 27058 Bricks - beige dark Ceramic bricks. 2000 pieces. 27059 Bricks - beige dark Ceramic bricks. 5000 pieces. 27060 Bricks - beige dark Ceramic bricks. 10000 pieces. 27061 Bricks - beige mix Ceramic bricks. 250 pieces. 27062 Bricks - beige mix Ceramic bricks. 500 pieces. 27063 Bricks - beige mix Ceramic bricks. 1000 pieces. 27064 Bricks - beige mix Ceramic bricks. 2000 pieces. 27065 Bricks - beige mix Ceramic bricks. 5000 pieces. 27066 Bricks - beige mix Ceramic bricks. 10000 pieces. 27067 Bricks - terracotta light Ceramic bricks. 250 pieces. 27068 Bricks - terracotta light Ceramic bricks. 500 pieces. 27069 Bricks - terracotta light Ceramic bricks. 1000 pieces. 27070 Bricks - terracotta light Ceramic bricks. 2000 pieces. 27071 Bricks - terracotta light Ceramic bricks. 5000 pieces. 27072 Bricks - terracotta light Ceramic bricks. 10000 pieces. 27073 Bricks - terracotta medium Ceramic bricks. 250 pieces. 27074 Bricks - terracotta medium Ceramic bricks. 500 pieces. 27075 Bricks - terracotta medium Ceramic bricks. 1000 pieces. 27076 Bricks - terracotta medium Ceramic bricks. 2000 pieces. 27077 Bricks - terracotta medium Ceramic bricks. 5000 pieces. 27078 Bricks - terracotta medium Ceramic bricks. 10000 pieces. 27079 Bricks - terracotta dark Ceramic bricks. 250 pieces. 27080 Bricks - terracotta dark Ceramic bricks. 500 pieces. 27081 Bricks - terracotta dark Ceramic bricks. 1000 pieces. 27082 Bricks - terracotta dark Ceramic bricks. 2000 pieces. 27083 Bricks - terracotta dark Ceramic bricks. 5000 pieces. 27084 Bricks - terracotta dark Ceramic bricks. 10000 pieces. 27085 Bricks - terracotta mix Ceramic bricks. 250 pieces. 27086 Bricks - terracotta mix Ceramic bricks. 500 pieces. 27087 Bricks - terracotta mix Ceramic bricks. 1000 pieces. 27088 Bricks - terracotta mix Ceramic bricks. 2000 pieces. 27089 Bricks - terracotta mix Ceramic bricks. 5000 pieces. 27090 Bricks - terracotta mix Ceramic bricks. 10000 pieces. 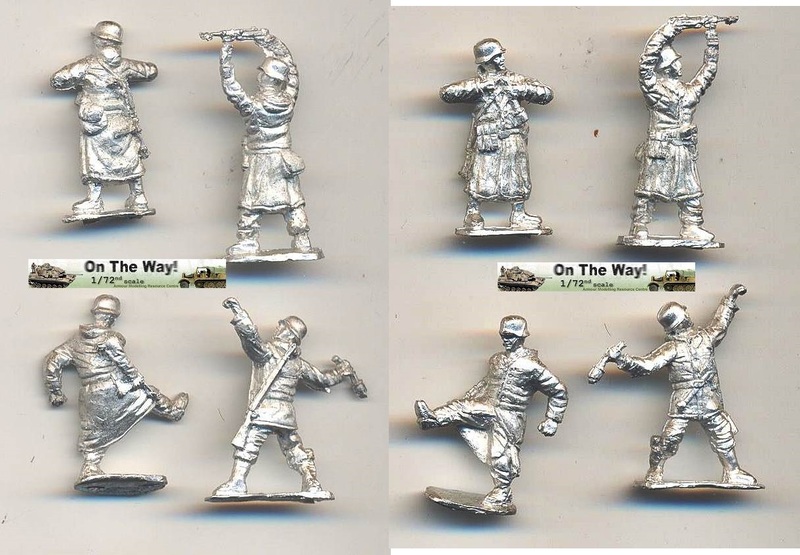 27124 WW2 German winter soldiers - attacking buildings 4 nicely sculpted metal figures in greatcoats. All poses are original and lively.